Red carpet season is officially here! The 70th annual Golden Globes was the first major awards show of the season, and the red carpet sparkled with film and television stars alike. As always, there were several color trends that appeared on the carpet. 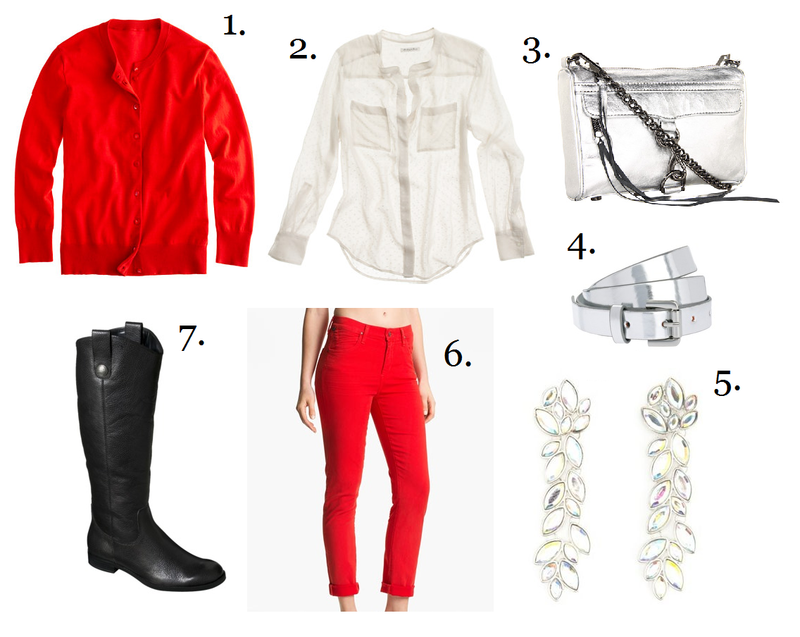 This year, a major one was red -- a classic Hollywood color and the perfect way to ring in the season. One star who stood out in the night’s biggest and brightest hue was Golden Globe winner Jennifer Lawrence, who knocked it out of the park in a Dior Haute Couture gown. Jennifer’s striking red dress was a perfect fit for the event and a perfect fit for her as well, highlighting the actress’ tiny waist with a simple silver belt and showing off her dangling rhinestone earrings. Simple smoky eyes and a box clutch completed Jennifer’s look, adding the necessary finishing touches without taking away from the award-worthy statement of the red gown. This look is all about color, and head-to-toe red is the way to go. A strong color like this is easily balanced with neutral accessories, like a white button down shirt and black riding boots, which keep the look clean and simple while letting the red jeans and cardigan really stand out. A fun pair of sparkling earrings echo Jennifer’s pair, adding a little bling to this look. A silver belt and small silver crossbody bag finish off the look, pulling all the pieces together and adding a little bit of shimmer to give this outfit the red carpet factor. This colorful outfit is a super wearable way to make a strong color statement, combining a classic red carpet color and simple pieces to create a nice balance. Simple accessories don’t overwhelm the outfit, and the little bits of metallic in this look are right on trend. This outfit would pair perfectly with a soft, smoky eye and a light lip color like the one Jennifer chose to wear, or you could switch it up and go for a strong red lip and a classic cat eye for an even bigger punch of color!